Women certainly enjoy the benefits of choice when it comes to purchasing cosmetics. 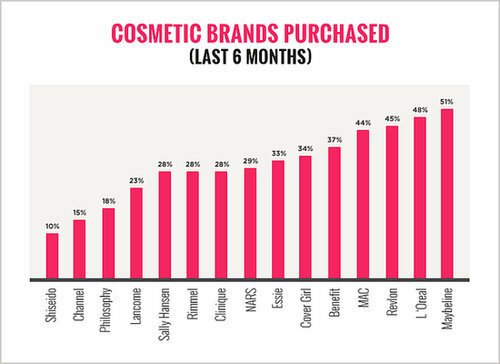 As part of the POPSUGAR Insights Q2 2014 beauty study, we asked women to tell us which cosmetics brands within the category they have heard of and which brands they've purchased in the last six months. Here are the results. Overall, 10 of the brands we asked about enjoyed awareness levels over 90%, with seven brands having awareness levels of 95% or higher. The three leading brands — Revlon, Maybelline, and L'Oréal — all enjoyed awareness levels of 97%. 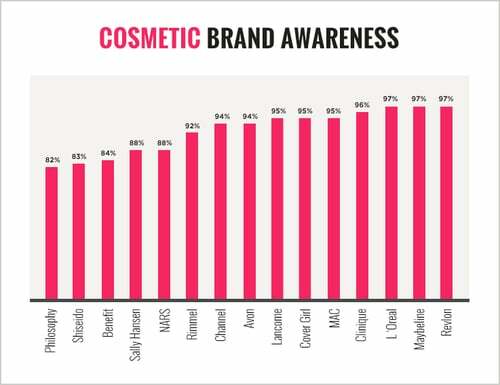 Of the 19 brands we asked about, 94% of them enjoyed awareness levels exceeding 75%. When it comes to past purchasing behaviors, however, a different story emerges. While the leading brand, Maybelline, had been purchased by a majority of women (51%), and L'Oréal (48%) and Revlon (45%) both enjoyed relatively high levels of past purchasing, other brands with very high levels of awareness were purchased by less than one-third of women in our survey. An example of this is Lancome, which had 95% awareness, but only 23% of women had purchased the brand in the last six months.